We’re leaving tomorrow!! All packed and ready to go, and I thought, hmmm, maybe my friends would like to know where we’re going and what we’re doing. We’re taking our tour through Gate 1 Travel. DAY 2, Friday – at the Century Park Hotel and hopefully sleep a bit before the tour begins! This tour will introduce you to Bangkok, the “City of Angels”. Drive through Chinese Town, the Indian Market, and the Wholesale Flower Market. Visit Wat Po (Temple of the Reclining Buddha), the oldest and first school for people in the olden days. See the famous golden Reclining Buddha statue, that is 160 feet long and 40 feet high. Before continuing to the Royal Avenue where most of the Government offices are located and the Palace of the Present King. This night we’ll check out a Siam Niramit dinner show. DAY 4, Sunday – Today we’ll spend a full day in Bangkok taking a half day Grand Palace and Emerald Buddha tour and then in the evening a Chao Phraya River dinner cruise. DAY 5, Monday – Today we travel to Ayutthaya the second and most prosperous capital of Thailand, from 1350-1767. On the way, we’ll stop at Bang Pa In Royal Palace. Bang Pa In was the royal summer palace for Thai kings. Originally constructed in 1632, the complex fell into disrepair. In the mid-1800’s, King Mongkut restored the site to its former glory. Upon arrival in Ayutthaya, enjoy sunset at Chai Wattanaram Temple. This temple was built by King Prasat Tong, who was actually a commoner who overthrew the previous king and took his throne. This is a lovely place to take in the nature and peace of Siam. We’ll spend the night in Ayutthaya at the Kantary Hotel. DAY 6, Tuesday – Today we travel north to Sukhothai. Sukhothai was founded in the 13th Century by King Ramkhamhaeng, as the capital of Siam. We will spend the night in Sukhothai at the Sukhothai Heritage Resort. DAY 7, Wednesday – Today we will see some of the most beautiful Thai art and architecture that was produced during Sukhothai’s golden era – between the 13th and 14th centuries. Modern Sukhothai is made up of the old town and new town. The old town of Sukhothai mainly consists of the large Historical Park, where most of the remains of the original city can be seen. We will see ancient Buddha figures, palace buildings and ruined temples. Later in the day, we will venture north for Chiang Rai to stay at the Le Meridian hotel there. DAY 8, Thursday – This morning we will travel to the town of Mae Sai – the northern-most point of Thailand, on the border of Myanmar. Here we may cross over into Myanmar for a little bit if we feel up to it. After the morning excursion, we will stop at the infamous Hall of Opium which combines a museum of the history of opium and the impact of illegal drugs, with an information center for research and extensive education on opium, opiates and other narcotics. In the evening we will visit the night bazaar for an evening of shopping for the local wares of Chiang Rai and also take a Mekong River cruise. We will spend this night in Chiang Rai also. DAY 9, Friday – Today we travel to Chiang Mai. Chiang Mai is the cultural heart of Northern Thailand. Located in the rolling foothills of the Himalayas, Chiang Mai’s remained isolated from the world until the 1920’s. I’m so excited because we will have a half day excursion to visit a Mae Salong Hill Tribe!! I’m so looking forward to this experience and to hopefully getting some fabulous photos of the area. We spend this night at the Le Meridien in Chiang Mai. DAY 10, Saturday – Today we will spend a full day in Chiang Mai. Chiang Mai is a city known for culture, nature and handicrafts. We will spend the morning visiting the Mae Sa Elephant Camp and then relax in the afternoon with a traditional Thai massage. We spend this night in Chiang Mai also. DAY 11, Sunday – Today we take a Chiang Mai City & Temples Tour visiting the most interesting temples in Chiang Mai. Your tour takes you to Wat Suan Dok, where the remains of the Chiang Mai Royal family are enshrined. The tour continues to Wat Phrathad Doi Suthep, erected in 1384 A.D. Located 3500 feet above sea level, Wat Phrathad Doi Suthep is Northern Thailand’s most sacred temple, containing a holy relic of Lord Buddha and a copper-plated chedi topped by a tiered gold parasol in its interior cloister. Equally impressive is the mythological Naga (Dragon-headed serpent) staircase, consisting of 290 steps leading up to the temple grounds. As you descend the stairs, there will be an opportunity to visit a local jade factory. We can then spend our afternoon at leisure. In the evening, we are invited for an authentic experience of dinner in a local Chiang Mai family home. We will recieve a tour of the home, and an open conversation of how a typical Thai family lives, all while enjoying the savors of home cooked Thai cuisine. 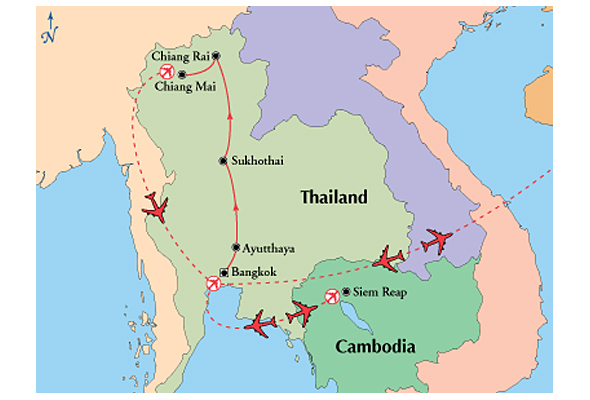 DAY 12, Monday – Today is a busy travel day as we head to Siem Reap in Cambodia. We will haev the afternoon to ourselves to tour around the town and then in the evening, we will have a typical Cambodian dinner and a traditional Apsara show. We spend the night at the Royal Empire Hotel in Siem Reap. DAY 13, Tuesday – Today we visit the fortified city of Angkor Thom where we will see the Terrace of the Elephants, Terrace of the Leper Kings, Baphuon, Phimeanakas, and the Royal Enclosure. We then continue to the highlight of Angkor Thom, the mysterious Bayon Temple, replete with beautifully preserved bas-reliefs and giant stone faces smiling enigmatically. Proceed to the other temple complex with monuments including Ta Keo , Kravan and Sras Srang . Of special note is Ta Prohm, where most of the jungle has not been cleared from the monuments, leaving the site as it would have appeared when European explorers first stumbled upon it. Then we continue to Angkor Wat, a temple dedicated to the Hindu god Vishnu. World-famous for its beauty and splendor, Angkor Wat features the longest continuous bas-relief in the world, which runs along the outer gallery walls and narrates stories from Hindu mythology. We will see the sunset at Angkor Wat – hoping for some incredible photos here!! We spend another night in Siem Reap. DAY 14, Wednesday – Today we will enjoy driving through the farming area and experience a ride on ox-cart used by local farmers as their transportation in Siem Reap. Then we’re off on a boat excursion on the Tonle Sap, or Great Lake, located in the heart of Cambodia. It boasts a rich and diverse ecosystem as well as floating fishing villages. Later, we’ll depart for a visit to the national museum revealing the royal historical path of the Golden Era of Khmer Kingdom through the state of the art multimedia technology to provide visitors a full picturesque story of the legend in an easy understanding way. In the afternoon we head back to Bangkok for our final evening there at the Century Park Hotel. DAY 15 Thursday – Today we head home, backtracking the way we went, Bangkok to Taiwan, Taiwan to Los Angeles, Los Angeles to San Jose. If we make all our flights (fingers crossed) we spend the night in our own beds getting snuggled by the frenchie! So, there you have it…if I have a chance to upload photos while away, I certainly will – even if it’s only a few teaser ones. Hope everyone has a safe and peaceful couple of weeks! !